Three years ago, J.J. Hendricks (above, left) of Denver paid $17,500 for a rare Nintendo cartridge— Nintendo World Championships, one of about 26 copies of a game for a promotional tournament more than 20 years old. About a year later, he opened negotiations to buy a cartridge even more rare. The game in question is Nintendo PowerFest '94 which, like the earlier World Championships was a suite of games modified for competition play. The competition was held in 1994 at more than 100 locations in the U.S. and Canada. Competitors had six minutes to play Super Mario Bros: Lost Levels, Super Mario Kart and Ken Griffey Jr Baseball. Winners advanced to a final round held in San Diego. 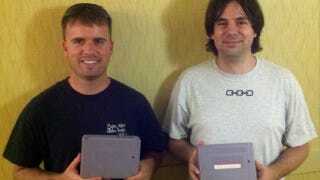 The Nintendo PowerFest '94 cartridges for were supposed to be returned to be destroyed. Only one was known to exist before Hendricks was contacted with an offer to buy a copy of the game, which came from the early rounds of the competition. You can see the owner of the rare cartridge, Rick Bruns, acquiring it in an image on this website. Hendricks finally bought the cartridge, but not without arranging a summit in a Vermont hotel and paying with a purple sack containing $12,000 in cash. If it sounds like something out of a film, well, Hendricks has a gift for that type of narrative (as we learned in the Nintendo World Championships purchase.) Best part? After completing the deal, Hendricks and Bruns faced off in their own PowerFest competition, with Bruns smoking Hendricks both times. Correction: An earlier version misidentified J.J. Hendricks in the top image.